The Tag Heuer Carrera WV2116.BA0787 men’s watch is a crisp looking model of the Tag Heuer brand and makes anyone wearing it look confident and well defined in their character. 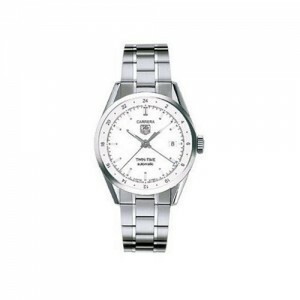 It perfectly aligns with Tag Heuer’s design philosophy that marries class, luxury, and practicality. Tag Heuer continually creates watches that are enviable to all those who see it and complements a wide range of environments and dress. This watch will not disappoint even the pickiest of people! This watch is durable in its design, has a sleek look of luxury, and comes loaded with great features. It is powered by the wearer’s arm movements; it does not even need a battery! Its durability comes from its use of a scratch resistant sapphire crystal and it is water resistant up to a depth of 30 meters (99 feet). Its case’s diameter is 41 millimeters and comes with a stainless steel band that has a folding clasp. If you find yourself in the dark or in a dimly lit room, the hands are luminous so that you will never be without knowing the time. It also has a sapphire crystal dial and a date window. Its face shows 24 hour time which adds to the sophisticated design of the watch and the sophisticated look of the wearer. It is a beautiful watch. It retails for US $2700 but a quick search on Google yields significant discounts. You just have to be willing to shop around a bit online to find the right price. Whatever the price, this watch is so well designed and built you will not be dissatisfied with your purchase. Further, the TAG Heuer brand is known and recognized worldwide for the quality of their timepieces. TAG Heuer is tireless in its efforts to ensure the quality of all its products. They rigorously test all pieces of the watch and ensure that throughout all phases of manufacturing each piece lives up to the TAG Heuer name. When you purchase a watch from Tag Heuer you are not simply purchasing a watch, you are buying a guarantee of quality and durability. Some people may not like the 24 hour dial. After all, it is not the conventionally accepted way to build a wrist watch. However, over time even those who may not like it will get used to it simply because it is unique and adds a degree of sophistication to the watch’s design. If you are in the market for a unique, beautiful, and sturdy watch the Tag Heuer Carrera WV2116.BA0787 men’s watch should not be overlooked. I highly recommend it.